This 50 minute one-way flight crosses over Puget Sound before landing at Friday Harbor in the San Juan Islands. Depart from the southern end of Lake Washington in Renton, located about 25 minutes from both downtown Seattle and Bellevue. 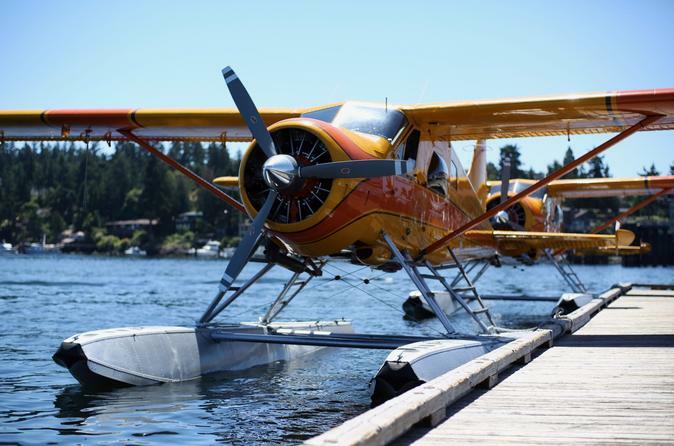 Here, you’ll meet your pilot and board the six-passenger de Havilland DHC-2 Beaver — a classic single-engine, propeller-driven bush plane fitted with floats — ideal for exploring this scenic terrain. Slip on your headset to hear the pilot’s commentary on the sights below. You’ll fly above Bill Gates’ rambling lakeside estate and enjoy premier aerial views of the Space Needle, which punctures Seattle’s panoramic skyline. During the flight, soak up the breathtaking mountain landscapes of the Olympic and Cascade ranges and be on the lookout for marine life not limited to orcas, minke whales, bald eagles, seals and sea lions. Situated just 90 miles (145 km) north of Seattle, the San Juan Islands include the popular Orcas Island and Lopez Island in its archipelago. Your pilot lands at Friday Harbor on San Juan Island, the second-largest and most populous of the islands.